What is Isis’ Connection with the Throne? The symbol of the throne has an intimate connection with Isis because “Throne” is the meaning of Her name. The Great Goddess Isis is the Great Goddess Throne. Many Egyptologists explain this by saying that Isis was originally the personification of the royal throne. It is certainly true that Isis was associated with the kingship—as were all the major Deities and most of the minor ones. The living king, seen as the embodiment of the God Horus, was considered the son of Isis (and of many other Goddesses). After death, the king became an Osiris so naturally Isis became his mourning widow. As the personification of the royal throne, Isis is the institution of the kingship itself. If we seek a feminist interpretation, we could rightly say that no king could take his place on the throne unless he had a close relationship with the Goddess Throne. To rule, the king must sit in the lap of the Goddess as Her child and husband. Yet for me, this explanation of the origin of the Goddess Who is the greatest Goddess of Egypt—and arguably the greatest Goddess of all time—is bloodless and boring. And it is a vast understatement of the true meaning of the Throne. As many readers know, Isis is the Greek version of the Goddess’ name. In Egyptian, She is Iset (Eset; Aset; Auset). One of the meanings of iset is throne. More generally, it means seat. The ancient Egyptians seemed to have had a flexible, idiomatic use for the word similar to its use in English. For example, when we say “he is in the seat of power,” we are not often referring to an actual seat, but mean that he is in charge. Similarly, iset smeter means judgment seat and the term referred to a tribunal of judges. Just as we say we have our heart set (a word that comes from seat) on something, the Egyptian wished for her iset ib—literally the seat of the heart—but meaning her heart’s desire. Even more generally, iset means place. Judging by the uses of it we have left to us, it often means an important or sacred place. Iset Weret is the Great Place, an idiom for Heaven. The iset wabet is the place of purity; that is, the sanctuary. Iset Mayet (Maat) is the place of law or truth; the Otherworld. Iset neferet is the beautiful place; the cemetery. Iset hotep is the place of peace; the tomb. Temples can be designated as isets, as the special places of the Deities. The Iset en Neit is the Temple of Neith. The Iset Heqit is the Place of the Frog Goddess, Heqit. Egyptologists believe that the gathering of people around the shrines of Deities played an important part in the early organization of Egyptian society. This is confirmed by the fact that one of the earliest Egyptian words for a settlement was seat or abode—and that it especially referred to the seat or abode of a Deity. Iset as place is also distinctly feminine. In hieroglyphs, one of the determinatives used to indicate cities (the seat or place of the Deity) is an egg. The same determinative is used to indicate both Goddesses and women in general. 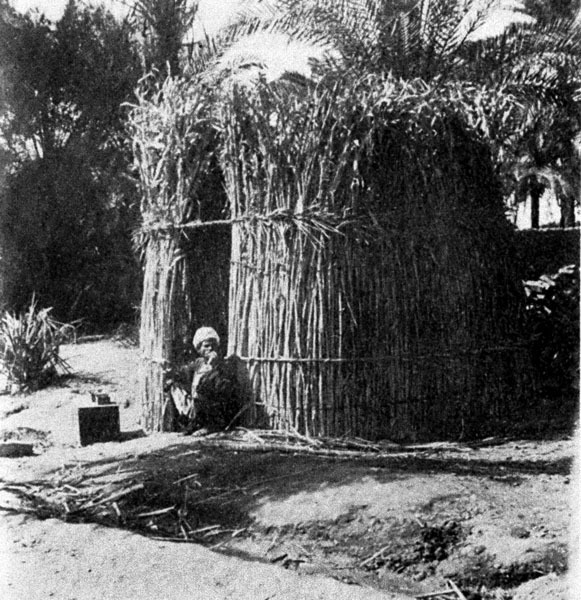 This image, from the Oriental Institute, University of Chicago, is of a reed and mud hut, perhaps the type that would have been built around an Iset of a Deity in an early Egyptian period. So an iset is feminine and it is a seat, an abode, a chamber, a tomb, a room, a place. Iset is location, a point in the circle, a crossing of the x, y, and z axes. Iset is somewhere. It is, in fact, the Primal Somewhere, the First Somewhere—and even the First Something. In the Coffin Texts, the androgynous Creator Deity Atum refers to the primordial state as the time “when my throne had not yet been put together that I might sit upon it.” Atum says S/He was “alone with Nu in lassitude, and I could find no place on which to stand or sit.” So before the coming together of the Throne, there was nothing but the Nu, nothing but the Primal Chaos, the Unformed, the Non-Being. But with the coming of the Throne, the universe begins to unfold. There is no longer nothing. Something exists and it is the Throne. Where before there was Non-Being, now there is Being Given Form, Being provided with a seat upon which to rest its Becoming, a point for all things to gather around. The Throne—Iset—is the Form of Being and the Place of Becoming. We can connect this primordial Iset with one of the most ancient forms of Goddess known to humankind; because for human beings, the Place of Being can be none other than the Earth. Therefore She Who is the Sacred Place must also be the Earth. She is the Great Mother Earth Who gives birth, bringing all things into existence. An Egyptian text—supposedly enormously ancient—also has something to tell us about the relationship between the Iset and the Earth. Pharaoh Shabaku (25th dynasty) thought this text so important that he preserved it by having it carved in stone. It explains how the God Ptah created the universe, how the Great Throne of Ptah provides sustenance for Egypt, and how Osiris, the Grain God, was drowned at Memphis, the city of Ptah (and a city that later became strongly connected with Isis and Osiris and with Isis and Serapis). 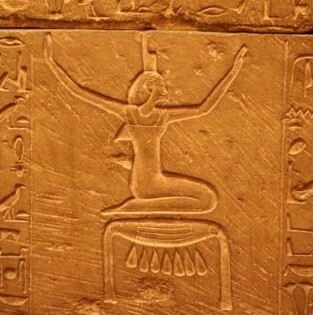 The text explains that the Great Throne is also called the Seat of All Life and the Lady of All Life because She provides Egypt with food. In this case, “Great Throne” probably refers to the sacred city of Memphis. If so, it is another example of Place being both personified and feminine. 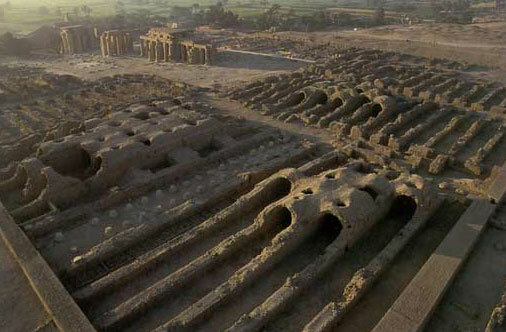 In addition, we are told that Memphis is known as the Granary of Ptah because Osiris was drowned there. Like the grain fields during the annual flood, Osiris, the Grain God, is drowned at the feet of the Great Throne, the Sacred Granary. 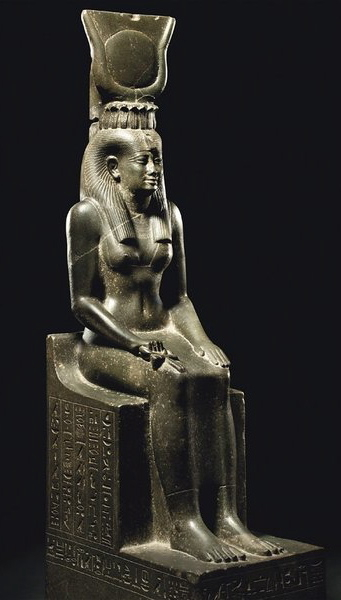 Here “Great Throne” does not specifically refer to Isis, the wife of Osiris. However, I believe that this myth could be a remnant from a time when the Great Goddess Throne was one and the same as the Great Earth Mother, the Goddess of the Place. She is the Goddess Who sustains the people by the grain that grows upon Her body and which She contains like a granary. Perhaps it is all that remains of the more ancient ascendancy of Iset, the Universal Goddess Throne, of Whom Iset, the wife of Osiris, is just one aspect. Great article, and much appreciated. While all theories are interesting, this line of thinking sits well with me personally, so I’m glad to see it supported. Keep up the great work 🙂 and good luck for all of your endeavours! “Loki: You sound like the Morningstar. Bartleby: You shut your %#^#ing mouth! If you haven’t seen this movie, it is very potty-mouthed and very funny. Kevin Smith refers to God as She in interviews. This brings us back to the Great Throne mentioned above. The Sumerian goddess Inanna also had a “sacred lap”, and she conferred kingship on the chosen of the Goddess. Runners perform a ‘victory lap’, or “lap of honor”, a circuit of the track after winning the race, reminiscent of the Pharaoh’s running a circuit as part of the Heb Sed, or Sed Festival, proving his fitness to remain king. As Horus-on-Earth, he had been loved and nourished on the lap of Isis-His-Mother in order to grow to become the king and sit on a throne. And then there’s “The Catbird Seat”!